Placed -- the advertising to in-store attribution company -- has signed up 40 new business partners, including new programmatic partnerships. Placed -- which has added programmatic partnerships including AdReady, OwnerIQ, Rubicon Project, TubeMogul, Turn, and Videology -- already had clients including wAdelphic, BrightRoll, DataXu, and The Trade Desk. New publisher clients include Conde Nast, DailyMail, Digital Trends, Flipboard, IGN, Resignation Media, SheKnows, SoundHound, Trusted Media Brands, WeatherBug, and Wikia. 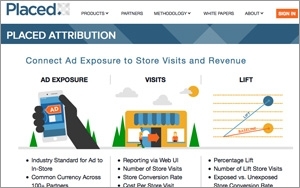 The 5-year-old Seattle-based company measures advertising exposure to in-store visits and consumers' offline behaviors through an opt-in location audience -- some 1.6 million users. The company says it now has more than 150 partners, which include publishers, networks, demand side platforms, out-of-home media, and agencies. Placed also made two key hires: Aaron Johnston, former head of agency sales and account management at DoubleClick, will be SVP of sales. Jim Watson, formerly COO of SPARQ and senior executive posts at Placements.io and aQuantive, will have the post of SVP of strategy and operations.